Step 1: Cut out each piece. 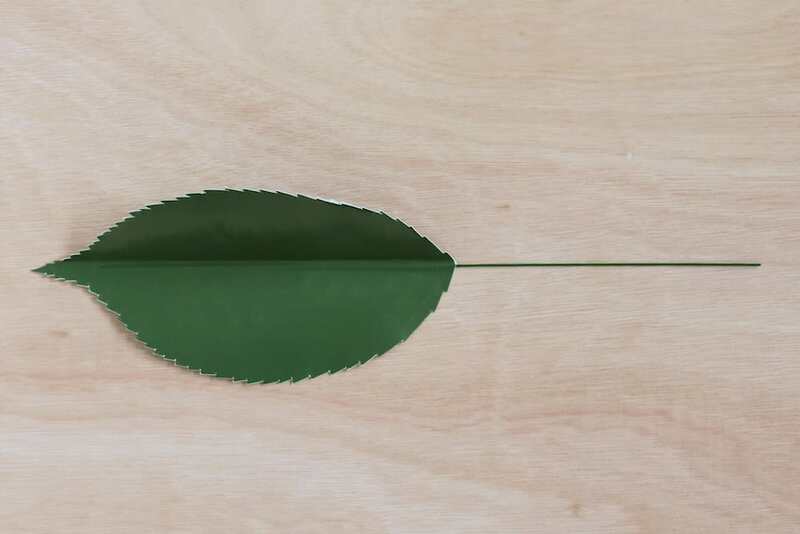 For the green leaf pieces, cut only around the edge of each rectangle for now, not along the white leaf-shaped lines yet. Step 2: Take the spiral piece and, beginning at the center, roll it up reasonably tightly. Squeeze slightly to keep the shape, then let go. 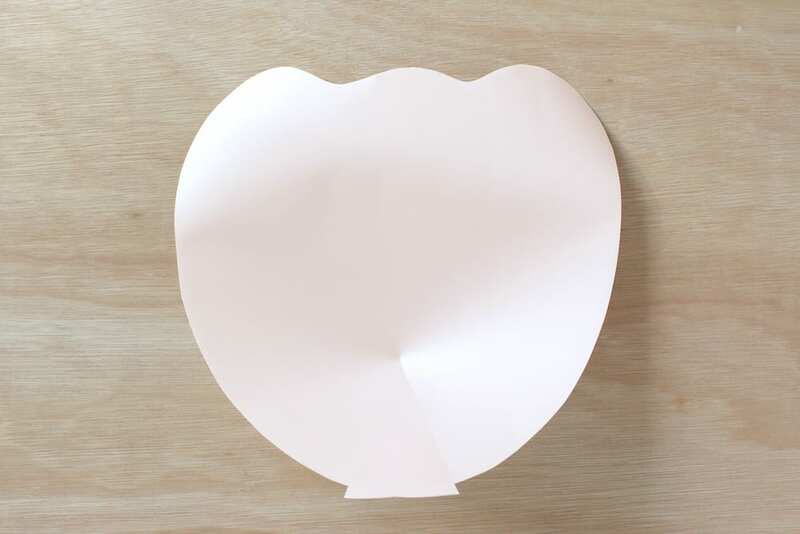 Step 3: Get the cut out pink circle piece ready. Roll the spiral up again, this time beginning at the outside end of the spiral, keeping the bottom edges as aligned as you can. 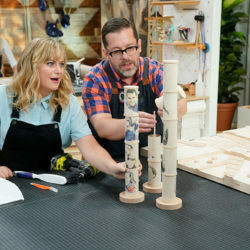 Use a glue gun to apply hot glue to the base of the roll and press onto the circle. 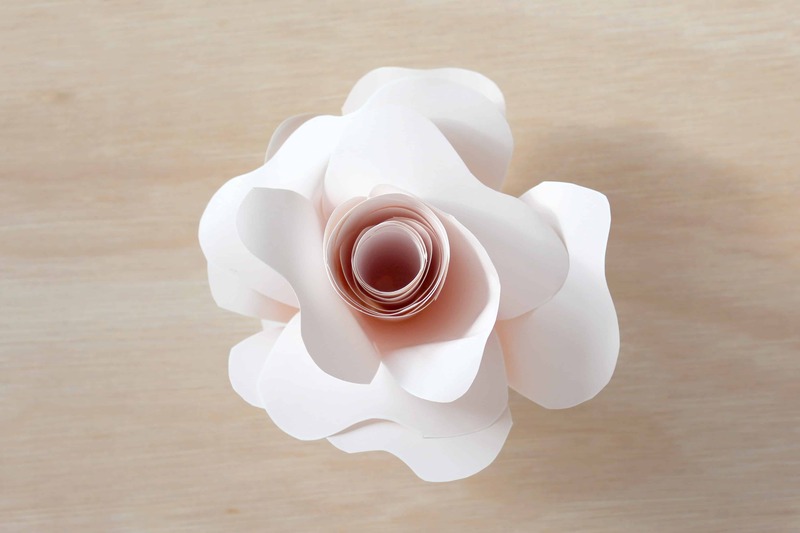 Step 4: Gently pull back the outer petals of the roll, bending outwards to create a flower-like look. Step 5: Trim the circle base piece, cutting around the edge of the roll. Step 6: Gather all petal pieces. 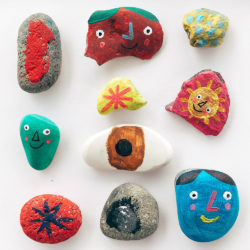 Take one and place printed side down with the cut slit pointing towards yourself. 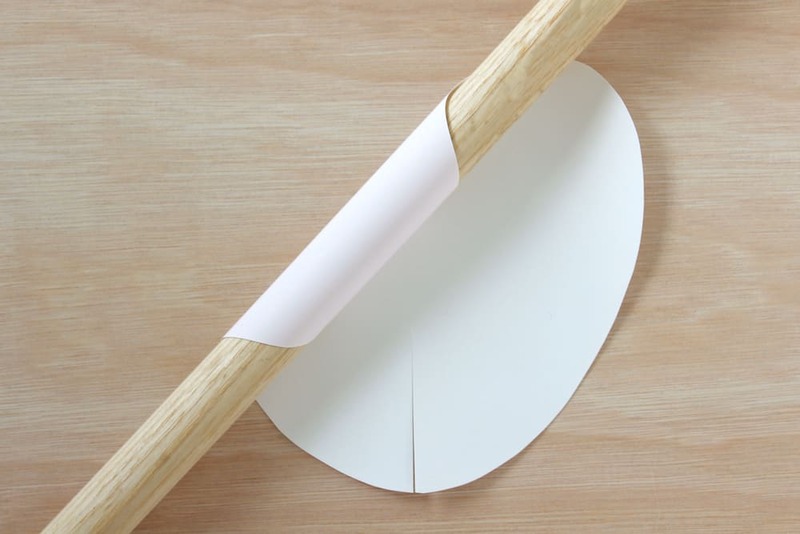 Take the wooden dowel and roll the far left and right points of the petal up around the dowel as shown to curl the piece. Repeat this for each petal. 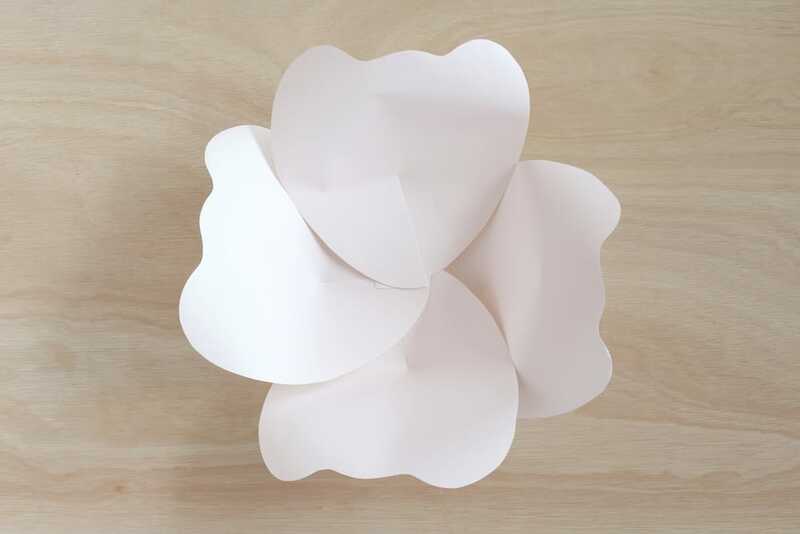 Step 7: Begin with the four largest petals. Overlap the two sides of the cut slit, and hot glue on top of one another to cup the petal as shown. 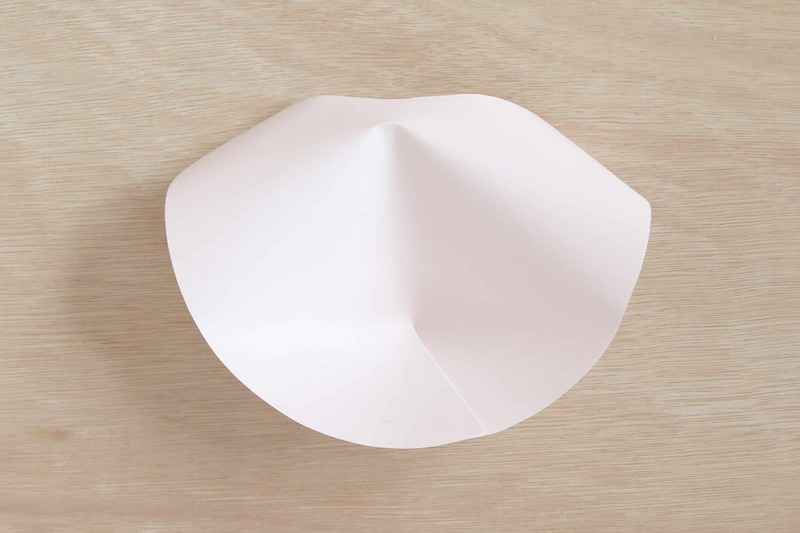 Repeat for the remaining three large petals. 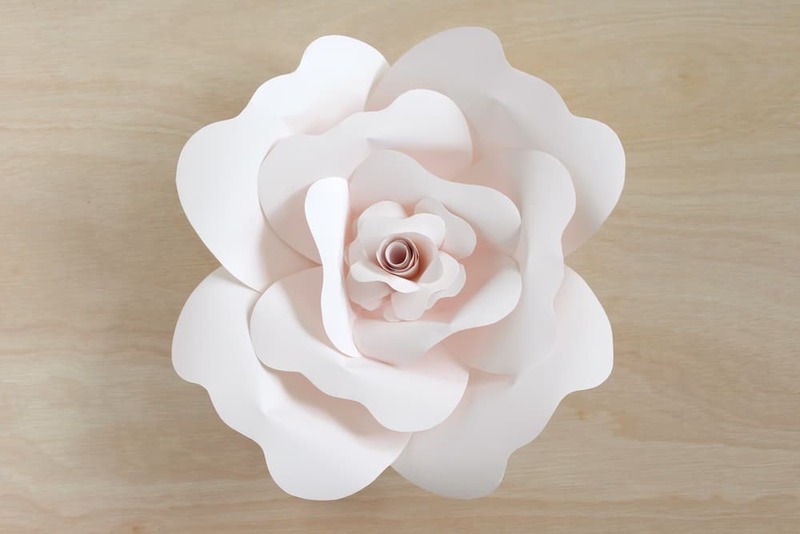 Step 8: Arrange the four large petals in the positions shown, gluing each petal to the next at the centre point. Step 9: Take the three medium sized petals. Repeat step 7 to cup the petals. 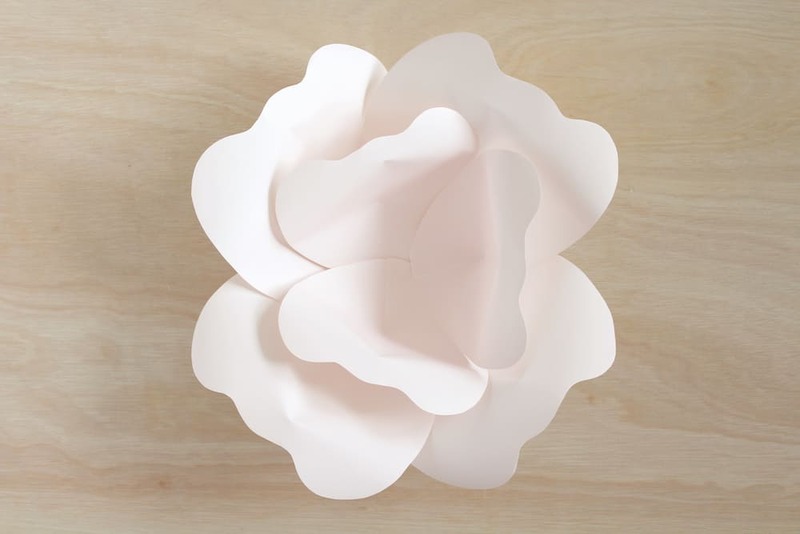 Arrange and glue the three medium petals on top of the large petals in the position shown. 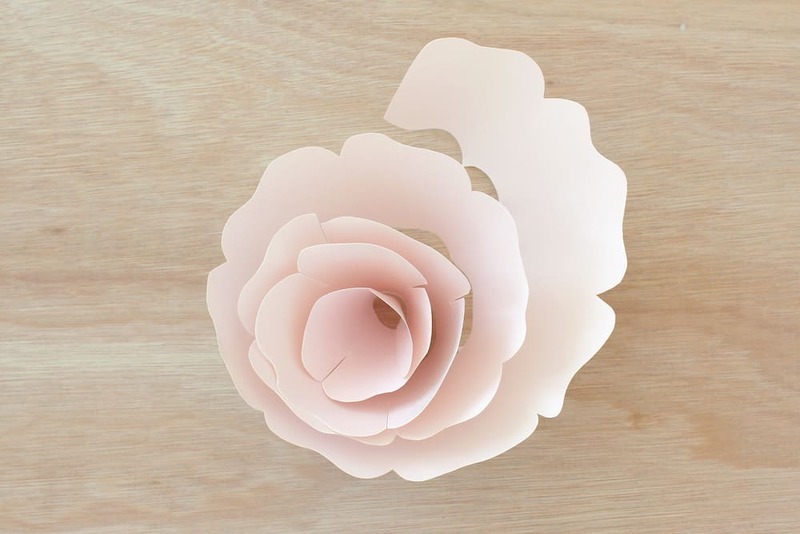 Step 10: Take the three small petals. Repeat step 7 to cup the petals. 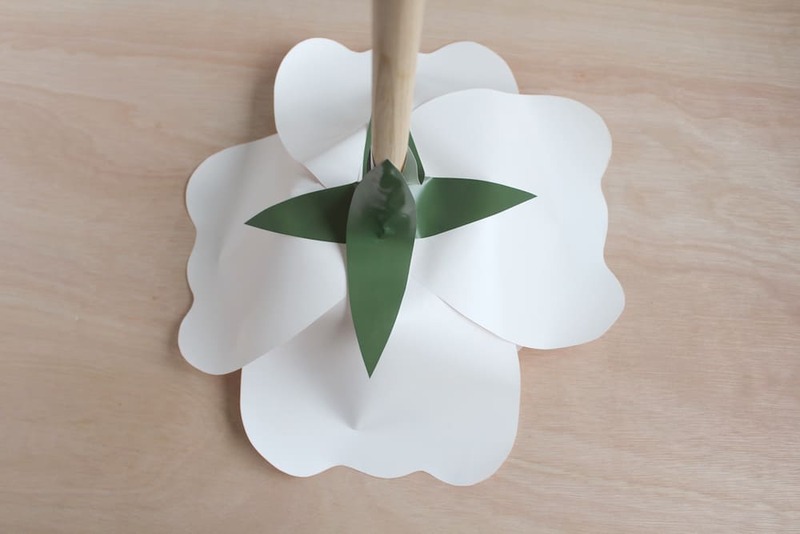 Arrange and glue the three small petals in the position shown. 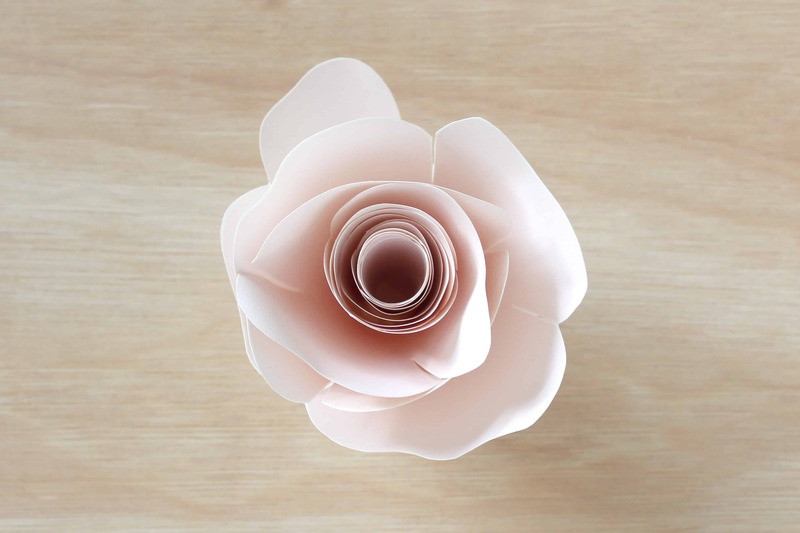 Step 11: Glue the rolled centre into the centre of the petals as shown. Step 12: Take a green rectangle piece and hold up to a light source, unprinted side towards you, so that you can see through. On the unprinted side, use a pen to mark the top and bottom point of the leaf. 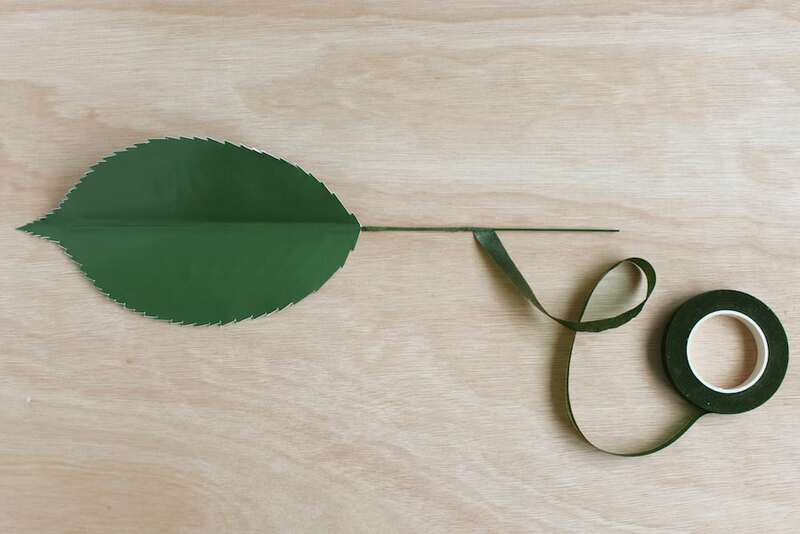 Take a piece of floral wire, and use tacky glue to glue it onto the back of the leaf in the position shown, starting around 2 cm from the top point of the leaf. 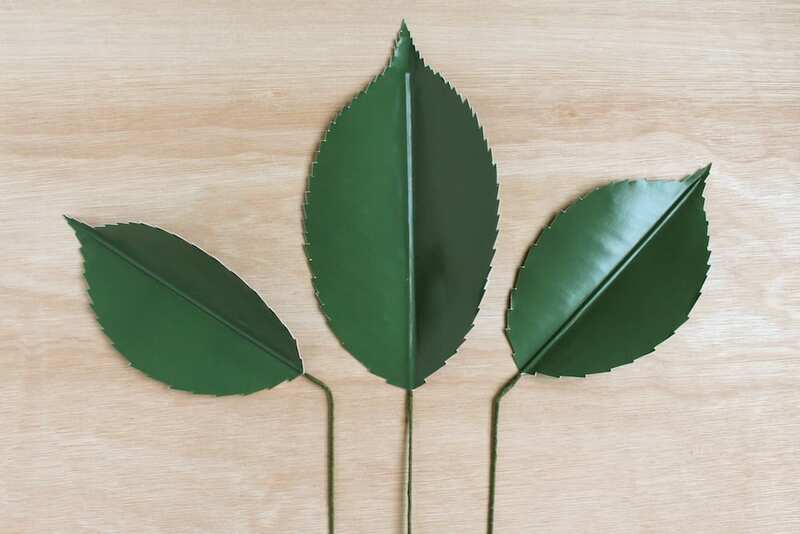 Step 13: Apply a thin layer of tacky glue to the back of the leaf area, then fold the other half of the green rectangle back on top of the leaf end and press down. 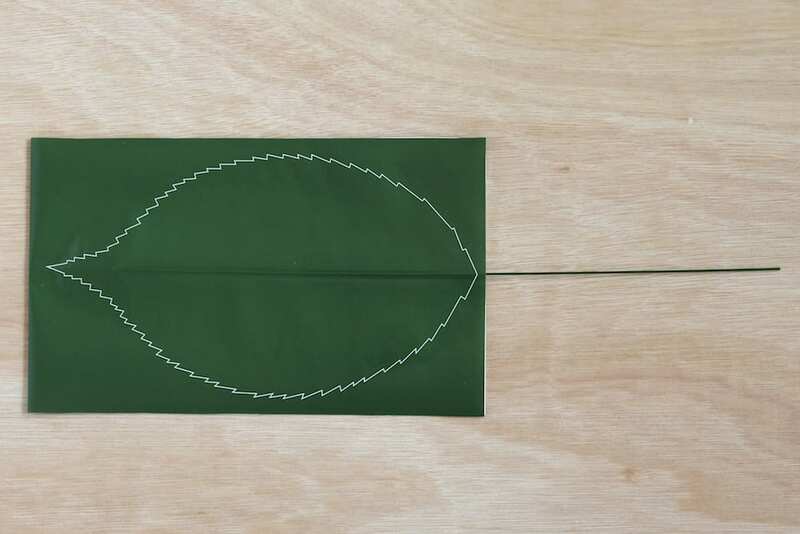 Cut along the white line to create the leaf shape, then fold the leaf in half, with the wire as the centre of the fold. Repeat steps 12 and 13 for all three leaves. 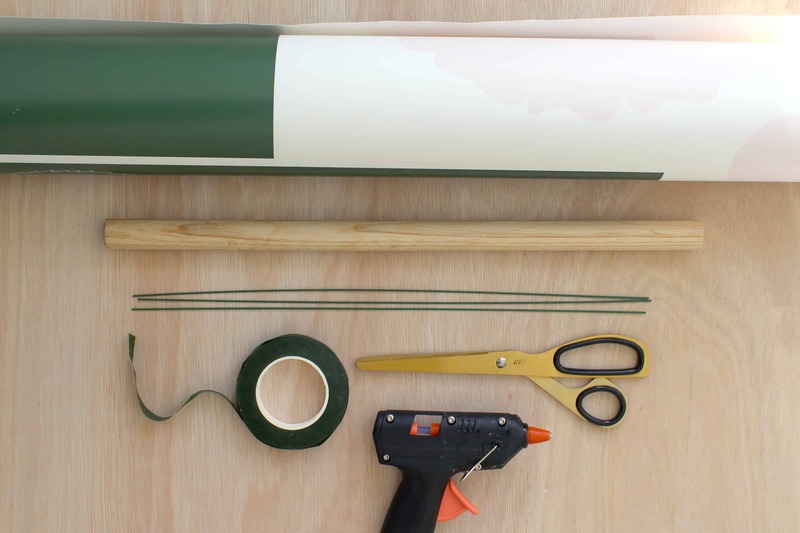 Step 14: Wrap the wires with floral tape. 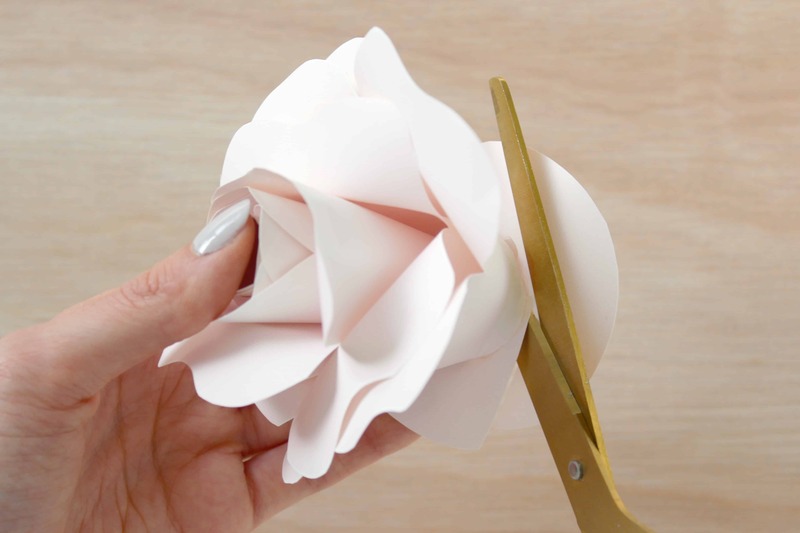 To use floral tape, you need to stretch the tape as you wrap to release the glue and allow the tape to adhere to itself. 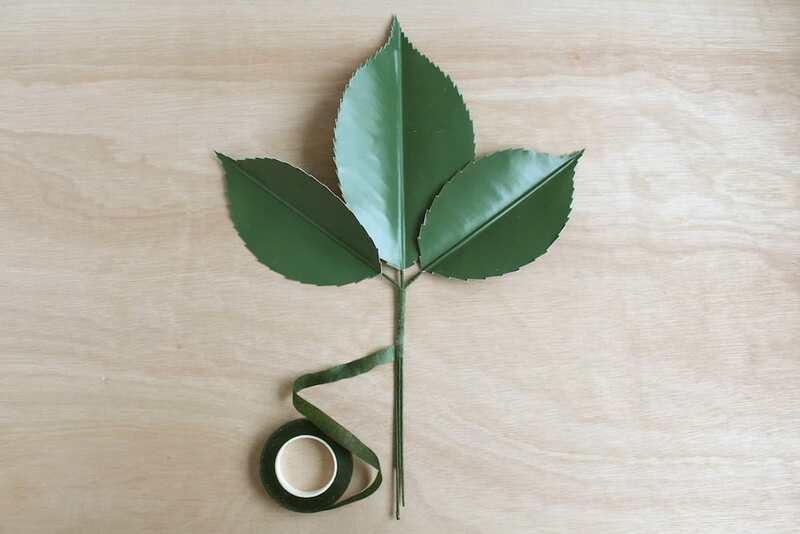 Step 15: Bend the wires of the two smaller leaves as shown, then wrap the stems of the three leaves all together with floral tape. 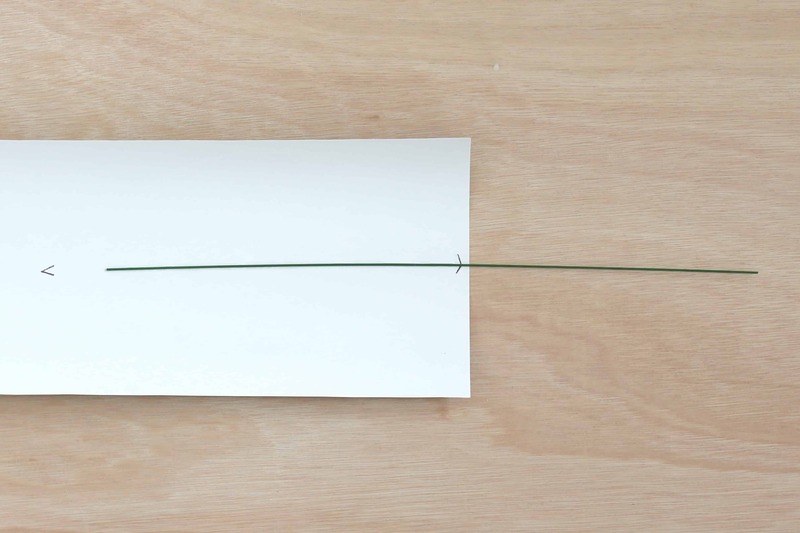 Step 16: Apply hot glue to the end of the wooden dowel and press it onto the back centre of the flower. 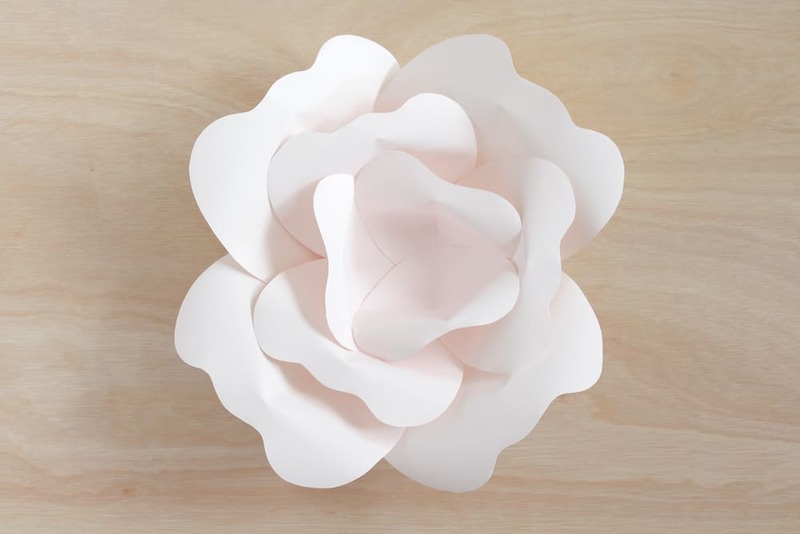 Take the four ellipse shaped pieces and hot glue them overlapping the seam between the back of the flower and the wooden dowel as shown, with one pointing to the middle of each petal. 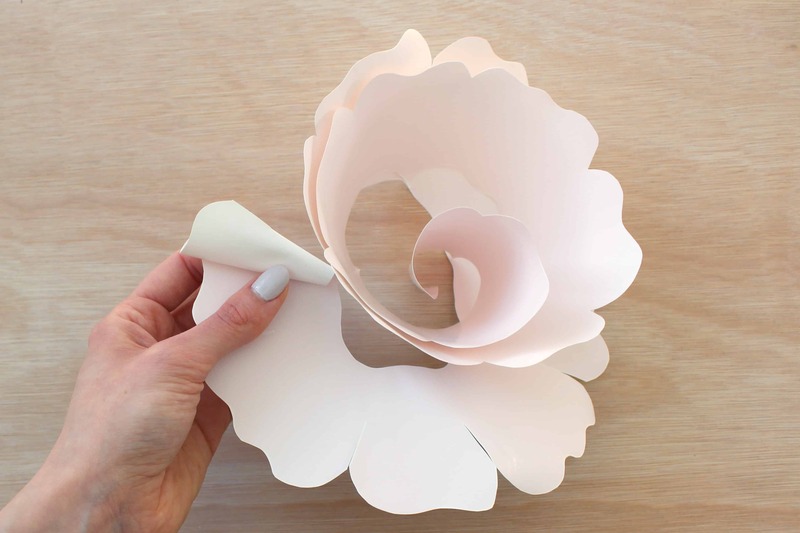 Step 17: Wrap the wooden dowel with floral tape, beginning on the ellipse shaped pieces and wrapping downwards. 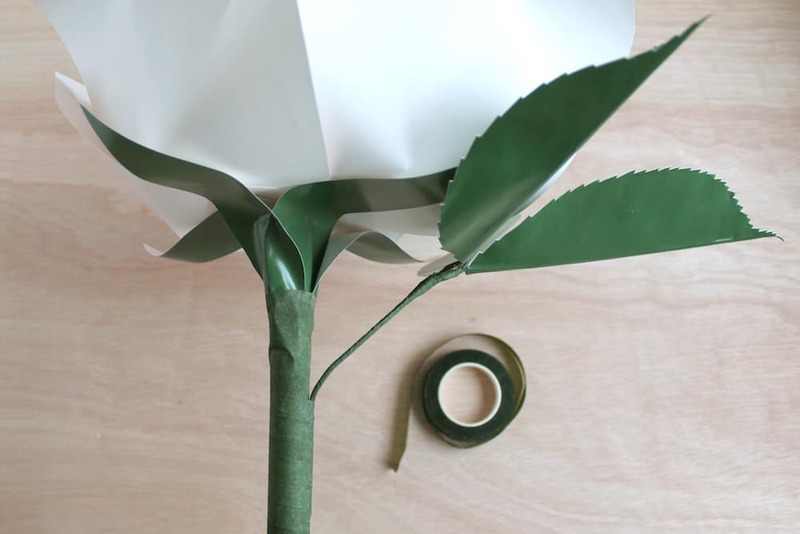 Around 8-10cm down the dowel, add the wire stem of the leaves, and continue to wrap with floral tape to the end of the dowel. And just like that you have a giant rose to bring you joy year round! 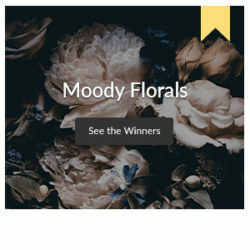 Add them to an oversized vase for an unexpected decor element in your living room or create a larger than life photo backdrop for your next celebration. 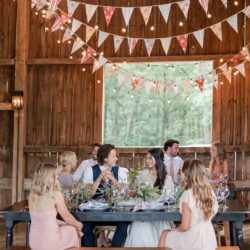 This project would be perfect for a party or even a DIY wedding! 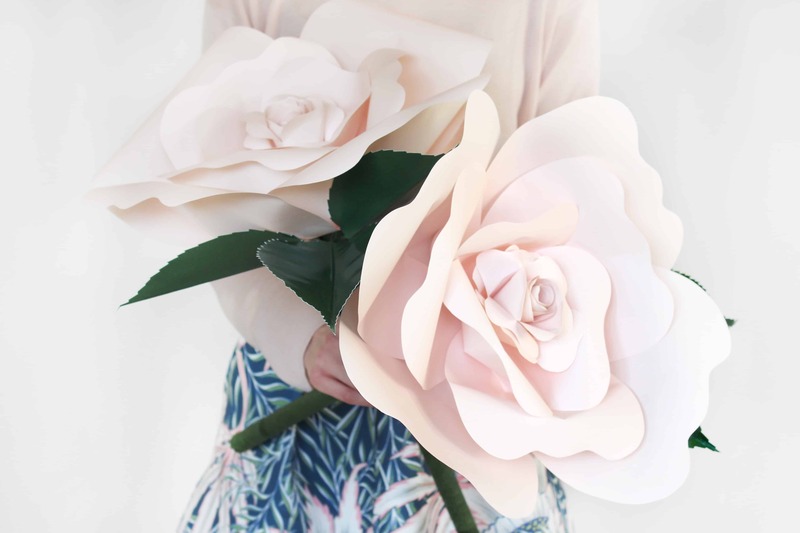 Find more wedding-ready DIYs here. 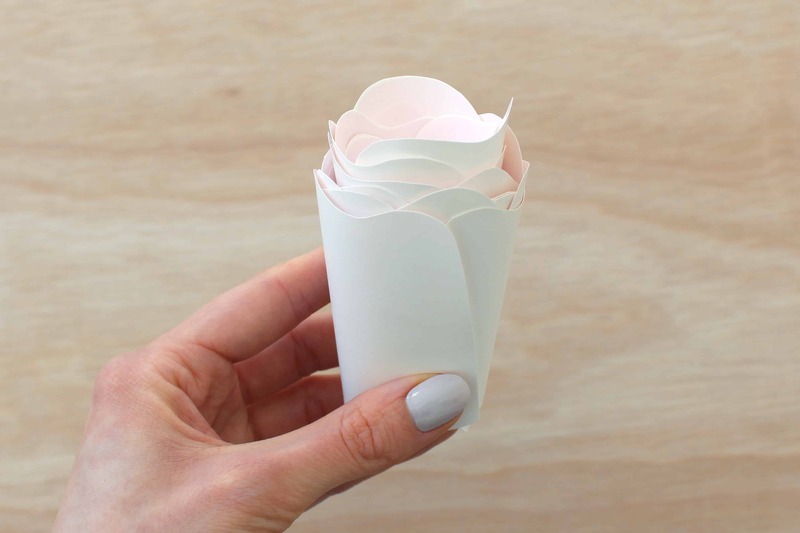 Sarah Louise Matthews is a paper engineer and paper product designer who just moved to Nottingham after 5 years living in London. 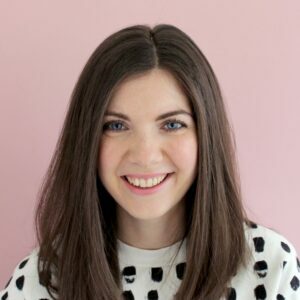 Sarah designs and makes fun, innovative stationery, artwork and decorations as well as bespoke commissions for anything from weddings to visual merchandising and is obsessed with beautiful stationery and tactile surfaces.